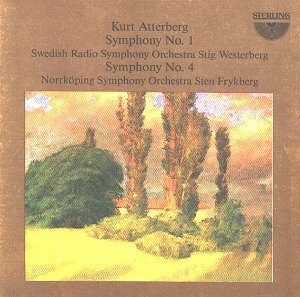 Atterberg's Symphony No. 1 is an impressive and considerable (40 or so minute) work for a young 24 year-old composer. It was written between 1908 and 1910; and first performed in Gothenburg in January 1912. "The Russians, Brahms and Reger were my ideals," commented Atterberg but according to a programme note from the 1920s, the themes breathe the latent harmony of Swedish folktune. The opening Allegro con fuoco movement is heroic and restless - it seems to speak of patriotic fervour and of elemental turbulence. Westerberg delivers a muscular performance driving the music forward so that it maintains its thrilling impact. The following Adagio-Presto (really the slow movement and scherzo combined) lasts nearly 17 minutes. The Adagio section is very beautifu, beginning prayer-like until the music broadens out to a lush Romantic theme - one might imagine a silvery seascape lying serene beneath a full moon. Indeed, in many places, I was reminded of Attterberg's later Symphony No.3 "West Coast Pictures." There is an important part for solo violin and the music slowly develops towards a radiant climax. The Presto portion of this music reminds one of the Russian composers beginning with Rimsky-Korsakov. It is brilliant, colourful and fast-moving - rather like an exhilarating ride with Cossacks. The final movement begins with a delicious love song which is passed to and fro amongst the violins and violas and woodwinds before it is sighed over by the cellos. The tempo accelerates and the music becomes much more macho-heroic with strong assertive material through to the end. A very appealing work which might have been stronger for a bit of judicious editing and shortening particularly of the second section of the finale. Atterberg's 4th Symphony "Sinfonia Piccola" is much shorter (just over twenty minutes). It benefits from a tight structure and its concision. Again folk material is the influence but one also detects echoes of Sibelius and Stenhammar The opening Con forza movement is again dramtic and fast moving with heroic material contrasted with music of quiet rural charm. The Andante is another Atterberg jewel. It has a quiet, rather frosty, crystalline beauty; a glittering matrix of very short motifs before a cor anglais weaves a lovely romantic melody over the texture, to be taken up later by the strings. The Scherzo is very brief at only 1:15; its assertive and merry - boozy even - with a cheeky sting in its tail. The final Rondo is high-spirited and sunny with charming clumsy innocence. The Norrköping players deliver a most persuasive performance of this charming little symphony.